Ghent is a picturesque city filled with the beauty and odor of millions of colorful flowers. Traveling here with a family becomes a real fairy tale. We would like you to suggest a couple of must-sees for you and your kids. Gravensteen Castle, Museum of Industrial Archeology and Textile, Frank Steyaert Gallery, as well as the World of Kina: The House and Centrum voor Jonge Kunst will appeal to your children and teach them much at the same time. Ghent is also rich with so many gaming facilities including Puzzle Escape Rooms, Locked, Sphinx Cinema and others, that your entire family won't find even a minute to get bored! If you are planning to explore Ghent with your family, you are likely to need a reliable means of transportation. 8Rental is a car rental service that offers exceptionally premium cars and chauffeurs to all its clients. 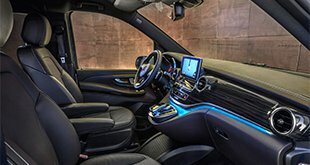 It has built a reputation of a trustworthy chauffeured service. Operating in the industry of passenger transportation in Europe for already several years, 8Rental has managed to serve millions of customers making them stay satisfied with their choice of car rental service. A high customer satisfaction level is what we always strive to get. If we don't manage to exceed your expectations, be sure, they will be at least satisfied! Rent a minivan with a driver in Ghent to experience the most comfortable traveling of your life! Get a quote from 8Rental to hire a van and drive in Ghent in complete comfort and safety. 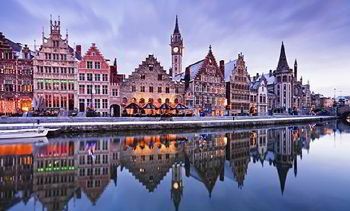 Find out all the miracles of Ghent with 8Rental! When booking a van abroad, you need to take into consideration such aspects as the number of passengers that are supposed to drive with you in the vehicle, as well as their expectations and special requirements. 8Rental is eager to meet every client's demands. For instance, if there is a disabled person traveling with you, you can order special amenities for him/her. Surely, this will cost an additional fee, yet you will be certain your dear person feels as comfortable as possible. Moreover, all 8Rental services are priced quite affordable as compared with other rental companies. Hiring a van from our service before leaving for Ghent, you can have the vehicle meet you right at the airport and take you to your hotel. And if it's daytime and you feel too spirited to stay in your hotel room, your booked driver can make a brief tour around the city and introduce you the most significant landmarks of the city before driving to the hotel. Additionally, renting a chauffeur-driven minibus in Ghent from 8Rental, the fuel is included in the offer. No matter how long you are going to stay in the city, or where you are planning to drive, the fuel is included in the fee of the offer. Just the same way, we shall undertake the payment of taxes and your insurance. You see that traveling with 8Rental is beneficial in so many ways! If you have a large family of eight persons and need a credible van then we advise you to book a Mercedes Viano. This is a compact and affordable budget van, which is equipped with all the primary comfort amenities including safety system, audio system, air conditioning, central heating, etc. The van is in excellent condition just as all other vehicles 8Rental has in its fleet. Anyway, if you are heading to Ghent with even a larger group composed of up to twenty-four people, 8Rental suggests hiring a Mercedes Sprinter designed for accommodating up to two dozens of passengers. No matter which model you choose to hire a chauffeured minivan in Ghent, it is guaranteed to be your best decision! Each and every driver working for 8Rental is a real expert of his work! 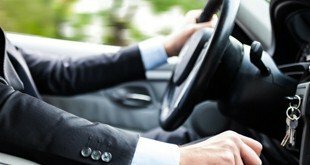 All our chauffeurs are licensed, experienced and responsible. They are well aware of all the roads of the city, hence will take the necessary direction the moment you name the address. All of them are locals, which means that they can be not only your booked driver but also a city guide. Since they are also speaking several international languages they will be delighted to give you a tour and help you to see all the wonders that the city of Ghent can offer to you! 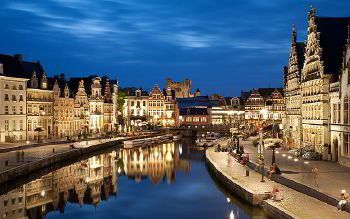 Book a chauffeur now and you will see how beautiful Ghent is!